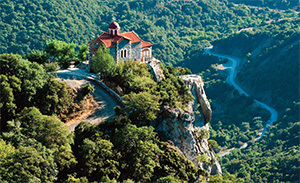 The beautiful village of Kastro is located only three kilometres from the Grecotel Olympia Riviera Resort. The imposing castle standing on the top of the hill was built in 1220 by the Franks and is considered an exquisite and representative sample of the fortification techniques of this period. Concerts and various cultural events often take place in the Castle of Chlemoutsi, by both local and foreign artists, a fact that gives you one more reason to visit the site. A special city with rich cultural inheritance and incomparable natural beauty, the warm and charming Nafpaktos has a great number of interesting sights that worth your visit: The castle (Kastro) at the top of the hill, the picturesque little port with the Venetian fortifications, the imposing old Clock, the Old City with its historical centre preserving its traditional character, the Botsari Mansion, the wonderful beaches Psani and Gribovo and, of course, the impressive Rio-Antirio bridge (officially called “Charilaos Trikoupis”) which dramatically improves the access to and from the Peloponnese and is considered a great technological achievement. In the mountains surrounding the city, the visitor has the opportunity to admire the wonderful landscapes, while enjoying athletic and recreational activities, like rafting in river Evenos, trekking and many more. Nafpaktos is also famous for the rich cultural and artistic activity, as well as for its intense night life, which satisfies even the most demanding expectations. Lambia or Divri is an old and colourful mountain village of Elis, near the border with Arcadia Prefecture. Today it is the seat of the homonymous municipality, with 400 inhabitants. The village is connected with the national road Tripoli-Patras (111). It is built upon the slopes of Mt. Lambeion (Divri), at 900 m altitude, and impresses the visitor with its beautiful stone houses, the rich vegetation and the fresh water springs that are found all over the place. As an ideal autumn destination, we strongly suggest the short journey to the colourful little town of Andritsena. The old cobbled streets that cross the green slopes of the hill where the town is built will give you the opportunity to enjoy an unforgettable walk among surprisingly beautiful stone buildings and old churches. You will enjoy the peace and harmony of the environment as much as the hospitality and warmth of its people.